Dichanthelium leibergii is a perennial cool season (C3) grass. D. leibergii is uncommon and found in only the most pristine prairies. Little is known about this species beyond its taxonomic description. Like other species of Dichanthelium, D. leibergii has two flowering phases, producing primary and secondary panicles. This characteristic is one of the factors distinguishing the genus Dichanthelium from the closely related genus Panicum. Breeding system: In Dichanthelium species, primary panicles are fully or partially chasmogamous (open flowers) and secondary panicles may be fully or partially cleistogamous (closed flowers). However, the specifics of the breeding system in D. leibergii has yet to be described. Flowering phenology: Primary panicles are produced from mid-May through July; secondary panicles from late June to September. 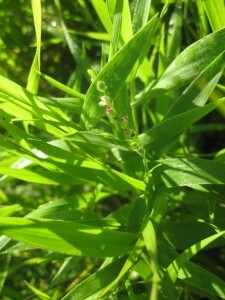 The USDA plant profile page for Dichanthelium leibergii.